Students wishing to major in Anthropology must complete a minimum of 34 semester hours in Anthropology at the 100 level and above, with a minimum overall GPA for all Anthropology classes of 2.0. 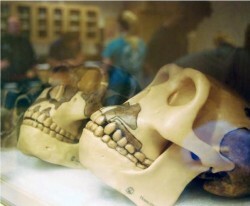 Many students wonder what sequence of Anthropology courses makes sense for majors? One of the goals of our program is to allow students the flexibility of creating their own individual sequence of courses tailored to their individual interests. However, there are a few simple rules to keep in mind as you proceed along your own, individual path towards completion of your degree requirements. Take the three introductory courses (ATY 213, 253 + 253L, and 258) as soon as possible: these courses provide the necessary background for most of our advanced classes in each of the three sub disciplines (Cultural Anthropology, Biological Anthropology, and Archaeology). Students should take their Methods course during their sophomore or junior year. Note that Bio Methods (361) and Cultural Methods (360) are offered during Fall semester, while Archaeological Methods (362) is offered every Spring. ATY 363 must be taken before ATY 495. ATY 495 must be taken during your senior year. ATY 495 is offered every Fall and Spring. Students wishing to earn a minor in Anthropology must complete 15 semester hours in Anthropology from any course with an ATY prefix.